They are less than 100 square feet each, almost half the size of a single bedroom in a normal house. But these little spaces are making a huge impact in the lives of the women who use them. The Kenton Women’s Village Project started out in 2017 as a pilot to help homeless women. Located in the Kenton neighborhood in northeast Portland, the project provides housing on a transitional basis. Designed by local architectural firms and businesses, and with the support of Catholic Charities, the tiny community consists of individual micro-housing units called “pods”, each a private living space about half the size of the average bedroom. Though small, each person has just enough room for a bed and few personal belongings, the village of pods provides a warm place to live, privacy and safety. As a continuing part of our mission of caring, Allwood flooring collaborated with other local companies to donate materials and time to Kenton Women’s Village project, a cause that is helping homeless women find permanent housing. Since its beginning, the Kenton Women’s Village project has had to overcome its share of trials and tribulations as organizers worked through various hurdles to meet its main goal of transitioning residents to permanent housing. But it has been a success. To date, 24 women have already moved from the village into permanent housing with the assistance of Catholic Charities case managers. It has been so successful, in fact, that in July of 2018 the Kenton neighborhood overwhelmingly approved a grant for a new, larger location—giving Kenton Women’s Village a permanent home and allowing it to expand, nearly tripling its current capacity. To house more people though, the village needed more pods. In early 2019 a call went out for donations of materials, and volunteers, to build 24 new pods. An overwhelming number of businesses answered, including Allwood. Architects, designers, builders and community members all chipped in, providing building materials and labor. Each of the 24 new pods is built by a different group of people or organization who have volunteered. The construction is based on one of three different floor plans. However colors and layout were completely up to the group, and varied depending upon the materials they had. Some have a minimalist design; using simple, clean white paint or bare plywood. While others are more creative, sporting reclaimed wood or galvanized siding, and themed interior designs. But all of them make use of what they have to create something special. Allwood was able to provide a mix of hardwood and bamboo flooring for 10 of the pods. The final effect is a community that is cohesive and inviting. “It is amazing to see how creative each pod is, and how differently each group addressed the same blueprint. It really shows that architects, builders, and designers really are artists.” Said Petersen. Soon new residents will begin moving in and (for a while) will call Kenton Women’s Village home. And although this phase of the project is coming to a close, the work of reaching out to help those in need is an ongoing pursuit. 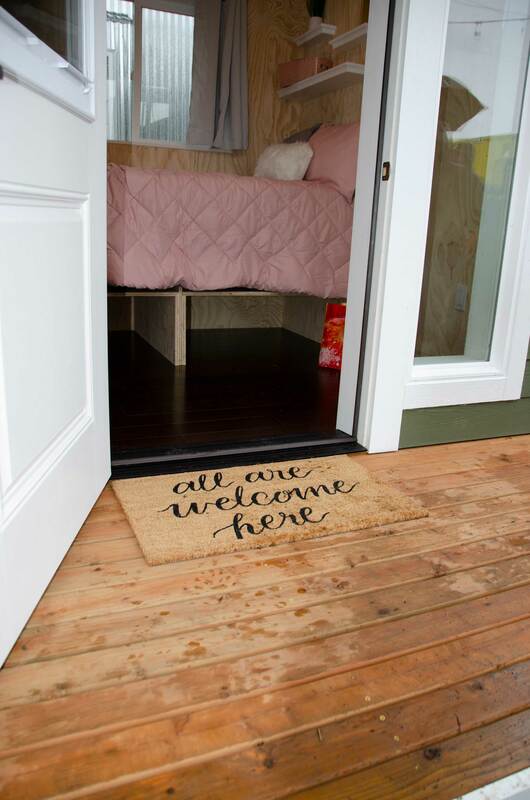 We at Allwood want to acknowledge each of the builders and partners who took our flooring and used it to help give a home to someone who would otherwise go without. A huge thanks to all. We are humbled by the opportunity to be a part of such an outstanding program as Kenton Women’s Village.